Back (l-r) Jessica Aldridge, Tom Kunzler, Ryan Parker, Mike Armstrong, Paul Ross, Nicole Whitesides. Front: Janet Halverson, Kristi Barfuss. As I mentally prepare myself to dig out the 1956 Dodge Coronet from its layers of dust, bird deposits, and more, I stumbled on this picture while looking for another picture. I thought I would share because these were/are some great friends. I hope I do not embarrass anybody too much. I just have the photo named Junior Prom. I do not seem to have any of the dance pictures so I cannot verify. Sorry Nicole, I cannot remember which dance(s) we went to in school. I remember this day at the Armstrong home northwest of Paul. I remember driving the Dodge out to pick up and drop off Nicole, but very little of the dance itself. 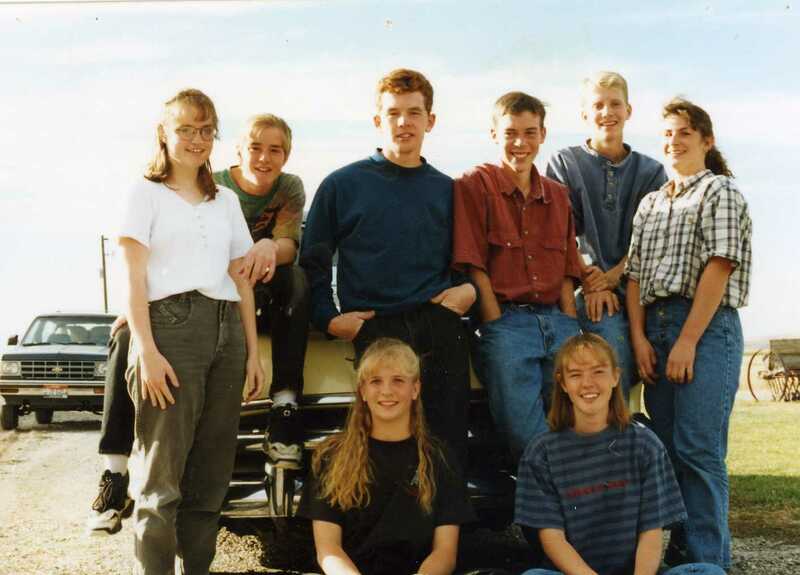 I even remember that all six of us rode in the Old Dodge to the dance and back. Fun date, fun times, great friends. It has come time for the information regarding the Jonas Album. There are a couple of generations in there, but like the Andra line, I will not include much information on the living individuals. Only those familiar with the line will find those photos interesting or of much value. However, you may be able to figure some of them out by their names. Some of this information has been given in previous posts. Particularly in relation to the Coley album and the Lost Trunk. I do have quite a bit more information in relation to some of these families. I have told some of the stories previously as well. I will have to post more later.